Get a Lenovo Smart Display 10" for $195! Lenovo Canada Lenovo: Lenovo Smart Display 10" with Google Assistant $194.99 (regularly $324.99) Get a Lenovo Smart Display 10" for $195! 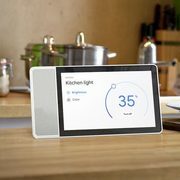 Get help from Google in any room with this deal from Lenovo, because you can get a Lenovo Smart Display 10" with Google Assistant for $194.99 (regularly $324.99) with free shipping, for a total savings of $130.00! This is the first time that Lenovo has stocked the Smart Display 10" in Canada and for comparison, the smaller 8" model is currently listed for $259.99 at Best Buy. This deal is available online only for a limited time. Quantities are limited, so shop quickly before stock is gone! I just picked up the 8 inch a month ago...so tempted to get this too...not sure what to do. I purchased both and a Google Home Hub too. Home Hub is on the way. Very impressed with the 8" so far in the kitchen. 10" will be for the living room, and Home Hub in my bedroom. Where did you order the google home hub from? Hmmm... weren't a majority of the people that ordered the 8" last time it went on sale direct from Lenovo still waiting for it to come in? Ebates 6 percent. Anyone know of any coupons to make this deal better? I ordered mine in charcoal from eBay for $150 with free shipping. The seller (phones.n.more) is located in Canada and has sold many units before with great feedback. You can sign up for the email newsletter to net you $10 in savings. What is kinda strange, is that the quote that was manually created for me by the online agent showed $9.75 as my discount even though the total was ~$20 less than advertised... Actually, the discount was $19.50 from the sale price, almost as if they applied this code twice. Either way, I think their mistake was my savings. Is the only difference between the 8" model the 10" model the size? The agent made an error and gave you a 10% discount instead of the $10 that you requested. Yes. You're right. That makes more sense. Either way, I'm happy. Basically. The screen resolution also takes a jump. 1920 x 1200 vs 1280 x 800. And the speaker is bigger, 2" vs 1.75". Not at all the same. I've been using a Nexus 7 mounted to my nightstand for the past 7 years and I won't even begin with the frustrations of using this as a tabletop display. Sure it was a smart display before smart displays and gave me most/all of this functionality, but navigating small menu toggles to set alarms etc is very tedious and more so when you are waking up. These smart displays are purpose built, sit nicely on a counter, end table, nightstand, etc with power cord and displays designed with this type of navigation in mind. There really is no comparison and you would instantly regret your purchase once you compare them both side by side. I have ordered 8" model from Lenovo and still waiting to be shipped. Is it worth to update to 10" model. I can cancel 8" model and order 10"model. It really depends on where you want to use it. For your nightstand, I would recommend the 8" or even Google home hub. For a larger living area with more space such as end tables, I would recommend the 10". For the kitchen, it really depends on how much free real estate you have on your counters. Given how much I liked the 8" one, I won't hesitate to recommend the 10" for even better experience if price is not an issue.